“Korean Fermented Condiments” presented by the Korean Food Foundation earned recognition at ‘Madrid Fusion 2017’. Chairman Sook Ja Yoon of the Korean Food Foundation lectured at the Korean cooking class in the Korean Cultural Center, Madrid in Spain. 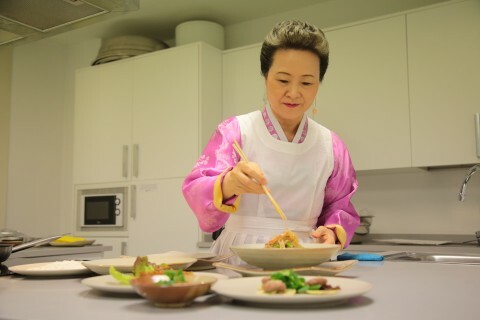 In addition to its event at Madrid Fusion 2017, the Korean Food Foundation offered a Korean food cooking class for the local people and media at the Korean Cultural Center in Spain allowing visitors to fully ‘experience’ Korean cuisine versus simply ‘visiting’ it. SEOUL, SOUTH KOREA--(Korea Newswire) January 31, 2017 -- The South Korean Ministry of Agriculture, Food and Rural Affairs Ministry of Agriculture, Food and Rural Affairs (“MAFRA”) and the Korean Food Foundation (“KFF”) participated in Madrid Fusion 2017 in Madrid, Spain from 23rd to 25th January, introducing the Korean traditional fermented condiments such as soybean paste and soy sauce to the world food industry. KFF chose to the theme ‘Korean Cuisine Meets Fresh Vegetables and Fermented Condiments’ and introduced many Korean dishes that exhibit the enhanced flavors of traditional fermented condiments, including the soy sauce and soybean paste. Many epicurean experts from around the world recognized these dishes as the future of healthy food. MAFRA and the Korean Food Foundation operated their Korean food booth for three days attracting a total of 4,000 visitors including food industry experts and famous chefs. Daily tasting shows were held serving dishes prepared with the Korean traditional fermented condiments; menus were slightly altered in ways that were more familiar to the foreign visitors to increase popularity. This year, KFF was successful in introducing Korea’s healthy food options, utilizing dishes that were prepared with Korean traditional fermented food ingredients and unfamiliar, low-calorie foods like agar and seaweed. Many industry players were pleased with the various menus that were introduced and demonstrated on each day of the festival. The media in Spain that participated in the demonstration, TVE and TELE CINCO reported the value of fermented food, which is the popular trend impacting the global cuisine. They acclaimed the superior value of Korean cuisine with various fermented dishes that use the fermented condiments such as soybean paste and hot pepper paste. On the last day, Chef Jae Duk Jung demonstrated how to make the ‘Healthy Vegetables and Seaweed Chips’ at the Multipurpose Hall. The dish was prepared with common vegetables such as potatoes, but attracted the appetites of people with its unique textures and flavors.